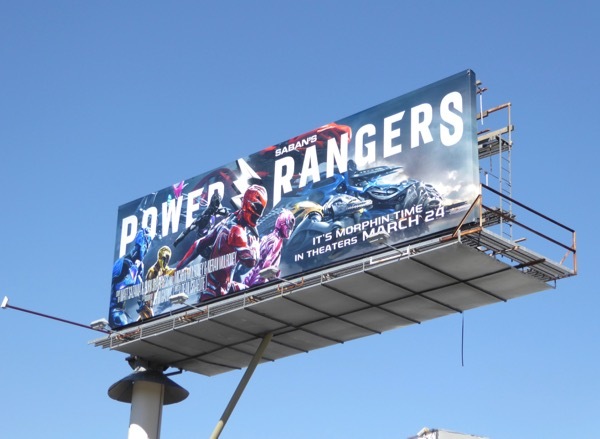 Fans of the 1990s TV series have been getting a rebooted burst of colourful nostalgia in L.A.'s city skyline this past month as Saban's Power Rangers once again take to the skies (and the big screen) to capture the imagination of a whole new generation. 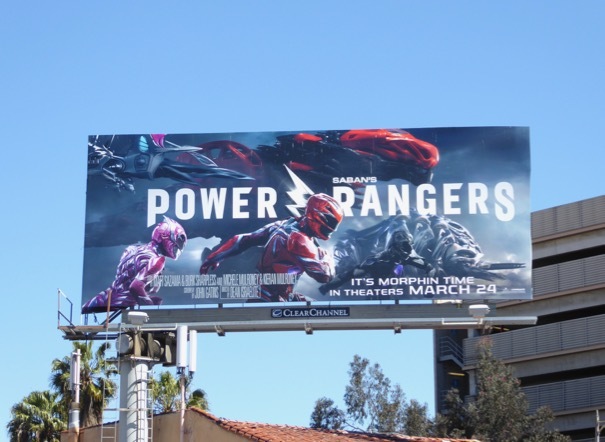 Once again a group of high-school kids stumble onto an alien ship and are transformed into a group of Power Rangers clad in colour-coded amours and helmets, able to summon and pilot assault animal-themed assault machines called Zords to protect humanity. 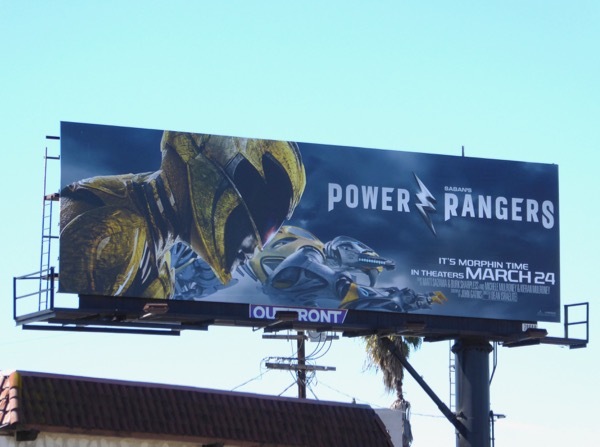 This time around Becky G is the Yellow Ranger (Trini), Dacre Montgomery is Red Ranger (Jason), Naomi Scott is Pink Ranger (Kimberly), Ludi Lin is Black Ranger (Zack) and RJ Cyler is Blue Ranger (Billy), a team of outcasts mentored by Bryan Cranston's 'Zordon' and united to fight the powerful witch and former Power Ranger, 'Rita Repulsa' (played by Elizabeth Banks) and her army of stone golems. 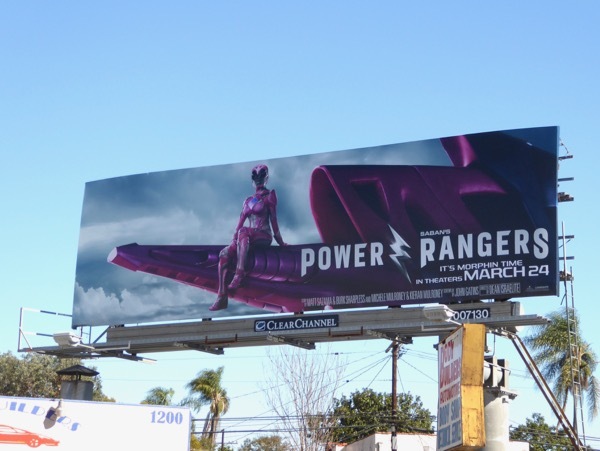 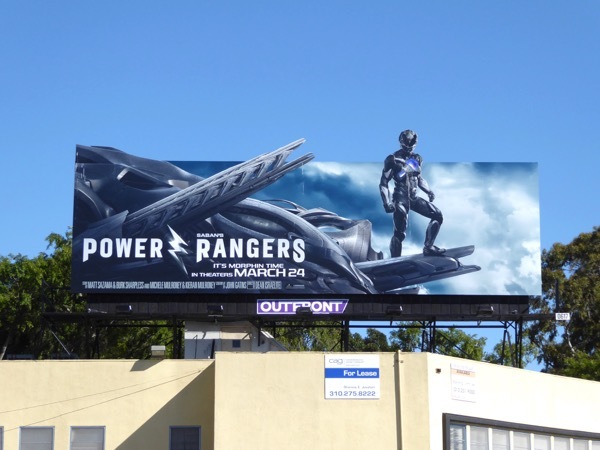 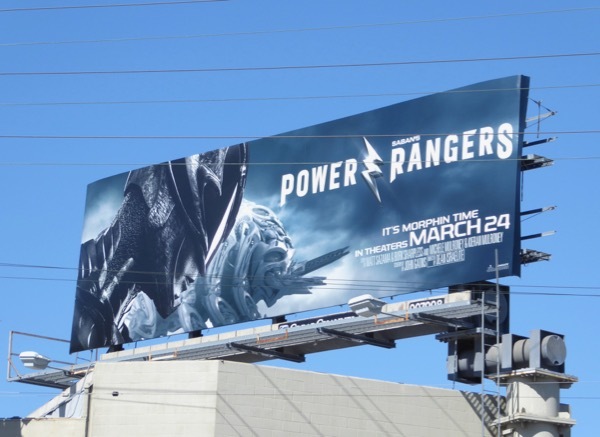 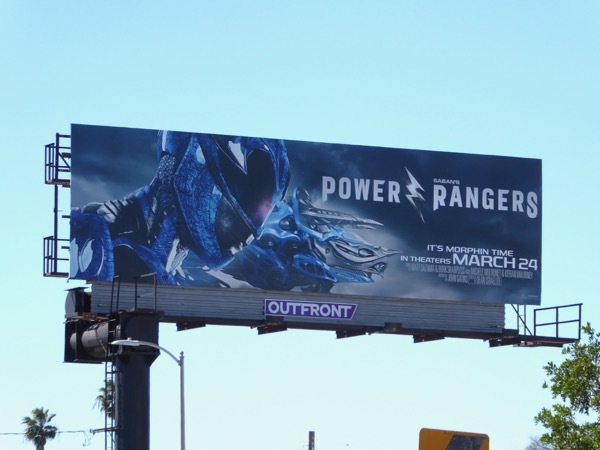 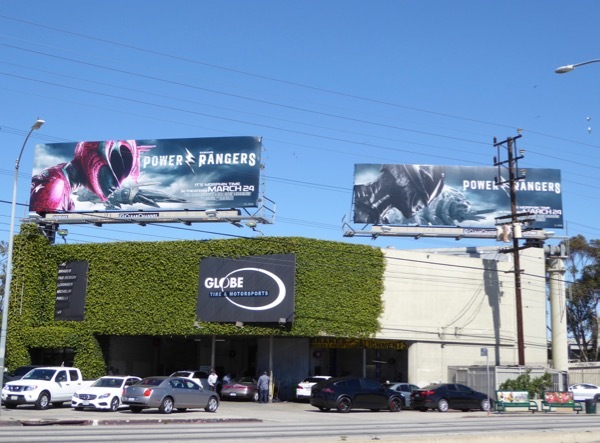 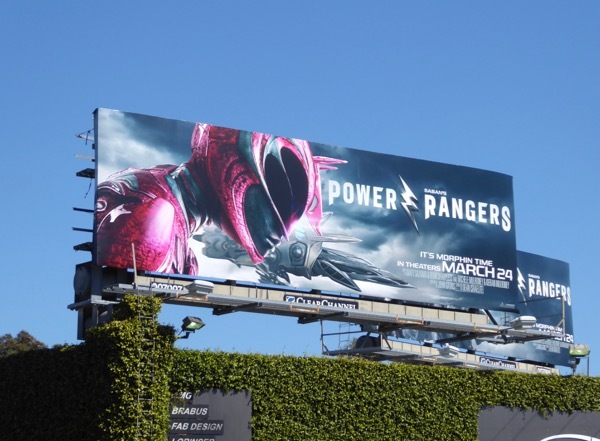 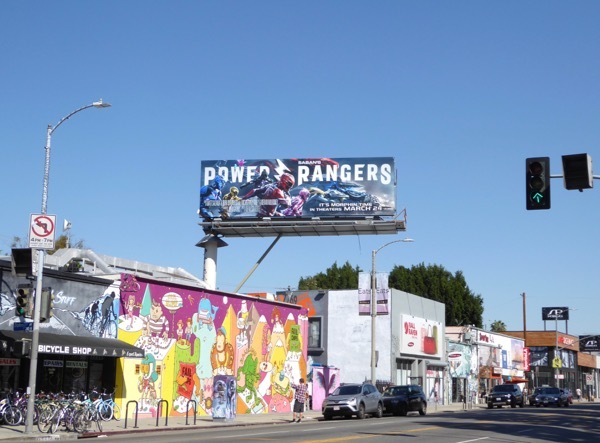 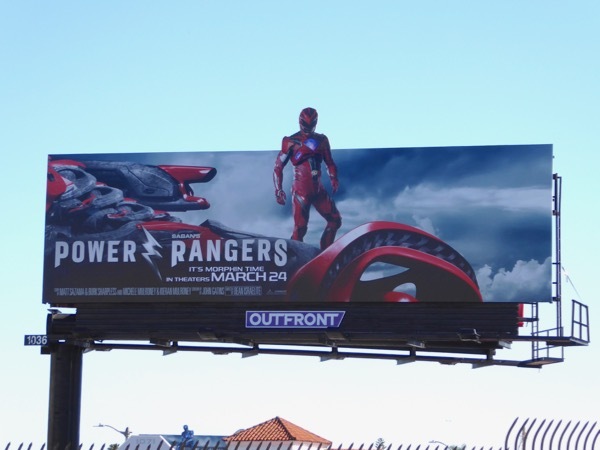 To make sure you don't miss them, the Power Rangers have taken over the busy La Brea Avenue commuter corridor with a whole host of billboards, including inter-connecting special extension character cut-outs of most of the Rangers and their Zords. 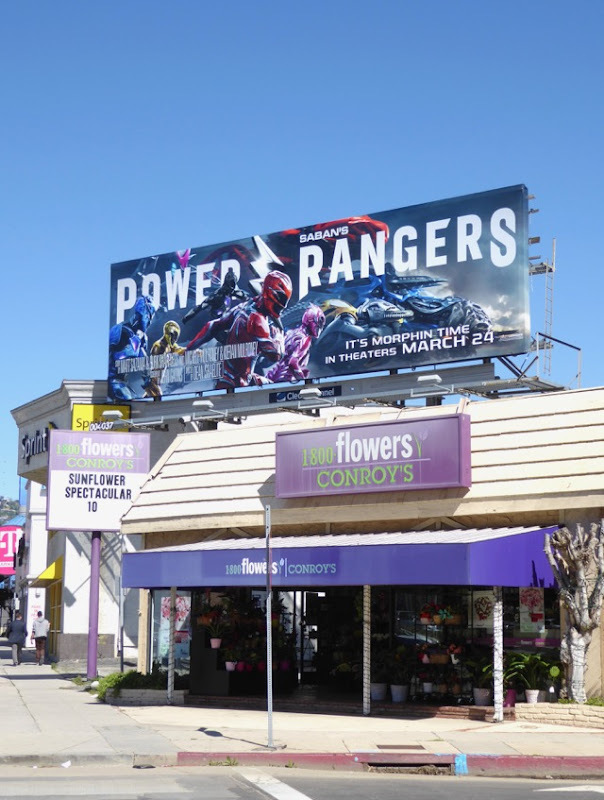 It's not the first time Daily Billboard has seen this busy road taken over by a movie in this fun way., make sure you also check out these Zoolander 2 movie billboards and these Teenage Mutant Ninja Turtles: Out of the Shadows billboards from last year. 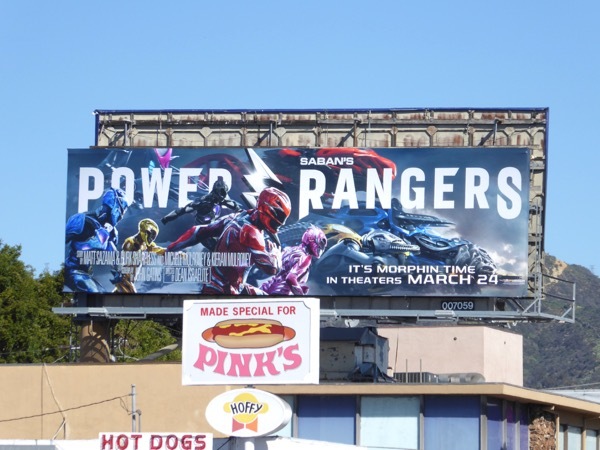 In their 90s television series the heroes sported lycra suits and most of the action footage was repurposed from Japan's Super Sentai Series and even though it did spawn a 1995 movie, it'll be interesting to see the revamped team of Power Rangers in contemporary, big-budgeted explosive CGI action. 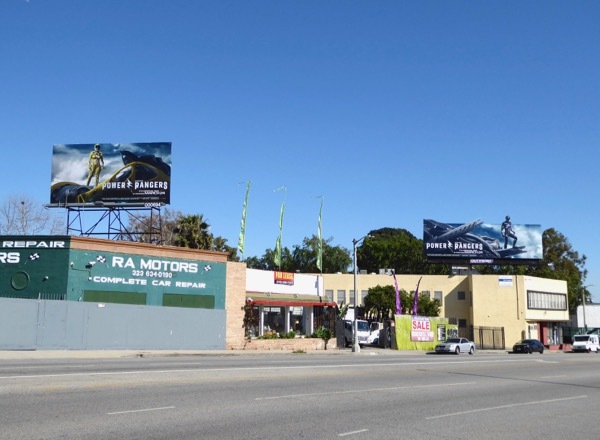 In addition to commandeering La Brea Avenue and team billboards spied all around the streets of L.A. from February 28 to March 13, 2017, the movie remake also took over the busy intersection of Venice and La Cienega Boulevards with character billboards and more on every corner to catch the eye of passing traffic. 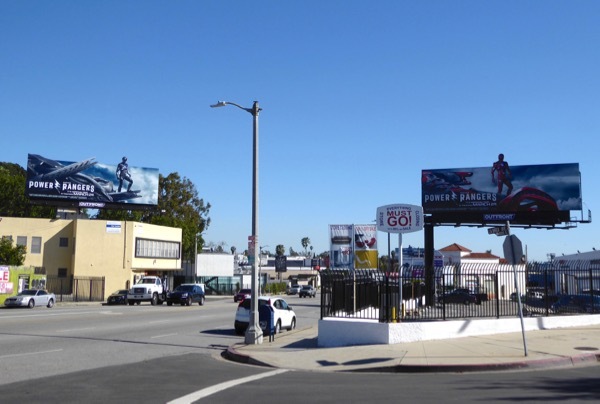 You can also compare this campaign to when these Captain America: Civil War movie billboards took over this prime outdoor location. 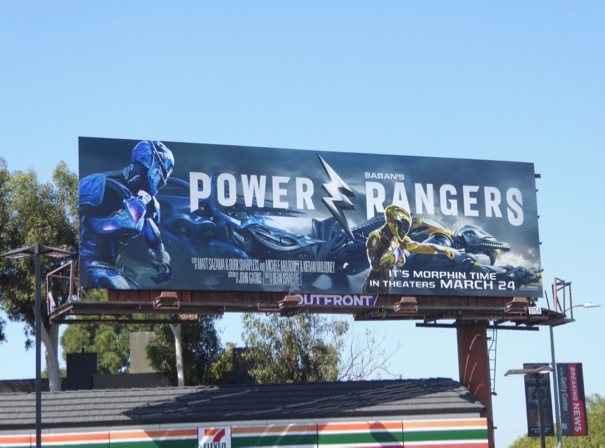 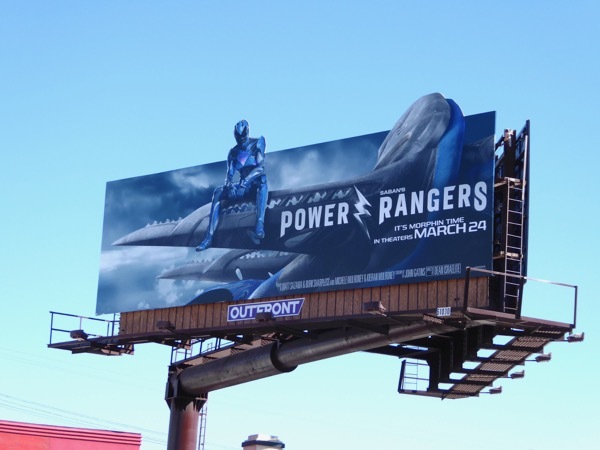 Did these billboards do the trick, are you convinced to give this shiny new version of the Power Rangers a try? 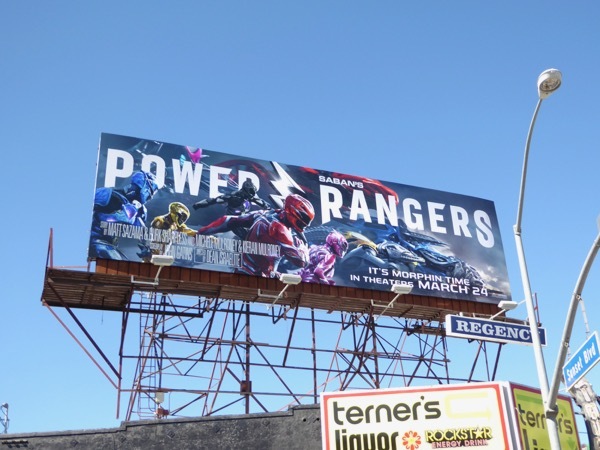 And maybe more importantly, which colour Ranger is your favourite? 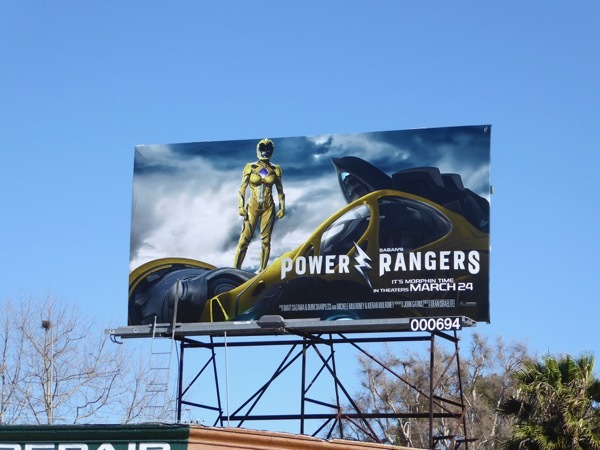 Red, Yellow, Pink, Blue or Black? 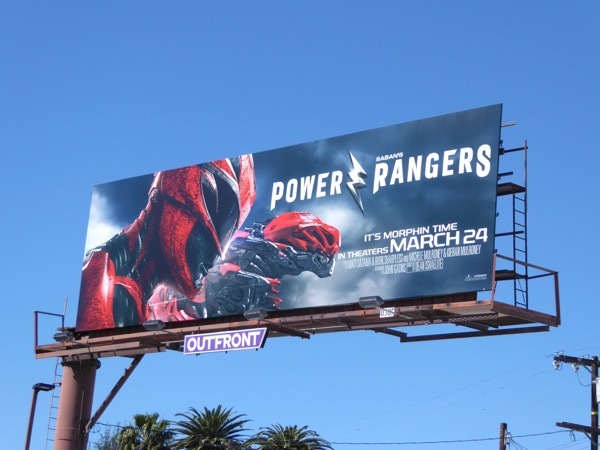 The film is certainly spending big on outdoor advertising support, so let's see if the Power Rangers can pack a punch at the box office this March with all the other popcorn blockbuster movies like Logan, Kong: Skull Island and Ghost in the Shell competing for your hard earned cash.